The Room. A movie so astonishingly bad that it’s become a cult classic. It’s Douglas Sirk by way of Ed Wood. No, that’s not being clever. That’s really what it’s like. The writer, producer, director and star is the now legendary Tommy Wiseau, the Orson Welles of bad movie making. The Room is the movie David Lynch would make if he somehow didn’t know he was David Lynch. Irony may return to myth. But this evidently is what irony can pass through along the way — a place where the audience not only knows more than the characters, it knows more than the creator. Just. Wow. After the jump, a couple of very brief clips (7 seconds, 21 seconds) that capture some of the movie’s most celebrated moments. And then, after that, if you can bear it, a scene of such grand guignol melodrama that it, well, deconstructs itself. This entry was posted in Popular Culture, Video on March 12, 2010 by Michael Happy. At Confederation the Conservative and Liberal parties represented opposed urban and rural interests, but the Conservatives were in power so long that the Laurier Liberals adopted practically their platform. So that since 1906 or 1911 or whenever it was or, for practical purposes, since 1867 there has been no real opposition in Canada, but only occasional shiftings of government due to scandals, slogans, bribery, disgust or the long continued graft of one party, and so on. The C.C.F. means a genuine labor agricultural opposition. Again, it should be the typical party of Canada and the political expression of the same movement of which the United Church is the religious expression. The connection between the two is brought out by the New Outlook. That is why it is socialistic. Government control of industry is essential if we are not to become a mere dumping ground for England and the U.S.A., just as a distinctive religious organization is necessary for the reasons I have gone over so often with you. 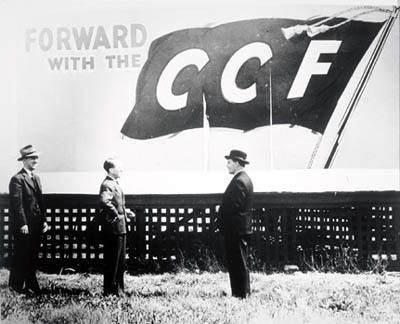 The Canadian Encyclopedia article on the C.C.F. here. This entry was posted in Bob Denham, Canada, Politics on March 12, 2010 by Bob Denham. The works that Martel has chosen to send to the Prime Minister are wide-ranging in their content and their reader impact. Some have a Canadian angle, from Milton Acorn’s collection of poems The Island Means Minago, or Tomson Highway’s hilarious The Rez Sisters to Voltaire’s Candide, in which it is said that the “French and English are fighting over a few acres of snow.” Others are rather deep but essential reading for any individual who seeks to lead, such as The Meditations by Roman Emperor Marcus Aurelius. If heavy-duty fare is not to Harper’s taste, there is, buried within the selection, a curriculum of books that would do a high-school student a world of good: Virginia Woolf’s To the Lighthouse, Northrop Frye’s The Educated Imagination (do you think a busy prime minister would take books with him to a desert island? ), William Shakespeare’s Julius Caesar, George Orwell’s Animal Farm (though the temptations of barnyard politics should have been foreseen by Martel), Harper Lee’s To Kill a Mockingbird and Jonathan Swift’s A Modest Proposal (just in case funding cutbacks lead to unforeseen menu changes). 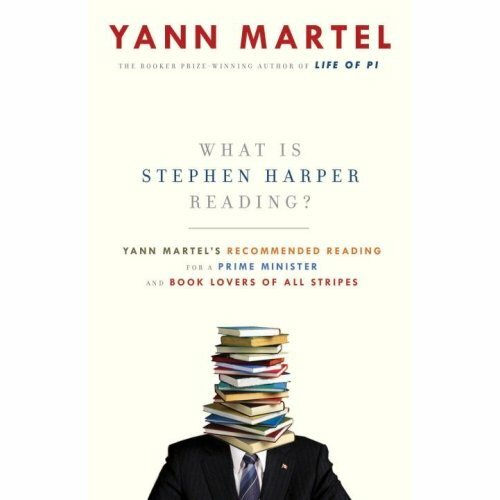 Harper has both Bachelor’s and Master’s degrees in economics from the University of Calgary, so it’s hard to imagine that he’s read many of Martel’s recommended works beyond what might have found its way onto his high school reading list more than thirty years ago. And as he “governs” without Parliament whenever it’s politically expedient for him to do so — witness two dubious prorogations of Parliament in one year — it’s a stretch at this point to think of him reading much beyond tracking polls and various public relations scenarios intended to convince skeptical Canadians that he really is just a cuddly moderate. Thanks to Harper, we only occasionally have full parliamentary representation in this country. But in its place we do have tightly-scripted government funded feel-good ad campaigns! It’s difficult to conceive of Harper as being anything other than a narrow special interest politician with big oil behind him. But please note that Canada is a signatory of the Kyoto Protocol and has legal obligations to meet its targets. And yet, Canadian greenhouse emissions currently exceed by 35% our commitment to reduce them. That is, we are 35% above our Kyoto targets to reduce below 1990 emissions levels. Under Harper, we are not reducing our emissions. We are increasing them. The Alberta tar sands produce some of the most environmentally degrading oil it is currently possible to produce. With just .5% of the world’s population, we account for 2.5% of the world’s carbon dioxide emissions, with a rise that has topped out at 20% during the Harper years. Per capita, we are among the very worst carbon polluters in the world. It’s therefore not hard to see who Stephen Harper is and what he really represents. Whatever he’s reading, it’s clearly not what he needs to be. Is this also a good time to point out that Liberal leader Michael Ignatieff is likely to have read most of if not all of the books that Martel recommends? Ignatieff, in contrast to Harper, is the recipient of 11 honorary degrees thanks to his extensive scholarly output over the years, including teaching posts at Oxford, Cambridge, the London School of Economics, and Harvard. Ignatieff has written a number of books, which include scholarly works, popular works of social concern, three novels and even a couple of screenplays. You can see Ignatieff’s bibliography here. There is no bibliography of books written by Stephen Harper. This entry was posted in Politics on March 12, 2010 by Michael Happy.